Preheat the oven to 220C, gas mark 7. Mix the flour, salt, bicarbonate of soda and Cheddar in a large bowl. Mix together the buttermilk (or yogurt), milk and mustard then pour into the bowl. Mix with a wooden spoon then, using your hands, bring together to make a soft dough. Knead lightly until smooth then shape into a 22cm round loaf. Cut the round into eight wedges then transfer to a non-stick baking sheet. Sprinkle with a little flour and bake for 20-25 minutes, until browned and crusty. Cool on a wire rack. Eat warm with some roasted cherry tomatoes (see Cook’s Tip, below). 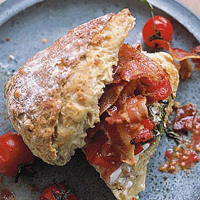 Any leftovers can be used the next day split, toasted, buttered and served topped with grilled bacon and oven-roasted cherry vine tomatoes. For roasted cherry tomatoes, place the tomatoes on a baking sheet and sprinkle with a little chopped fresh rosemary, some coarse sea salt and a drizzle of olive oil. Roast at 220C, gas mark 7 for 20 minutes until tender. Add a splash of balsamic vinegar and serve warm.